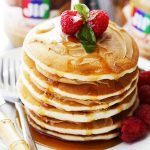 Buttermilk Pancakes – Fluffy, buttery and delicious, these are the most perfect Buttermilk Pancakes. Ditch the store-bought mix and make your own pancakes from scratch! 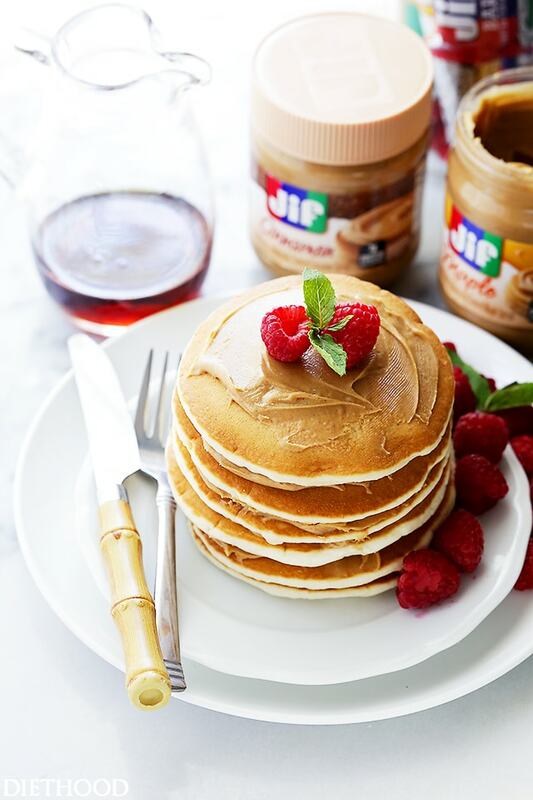 Stack ’em up, stack ’em high, spread some peanut butter on the fly! Pancakes are the hero of the breakfast table, and these Buttermilk Pancakes get high marks for being one of the most delicious pancake recipes! Clearly, in the business of rhymes, Eminem ain’t got nothin’ on me. Hey Hey! Happy Monday! 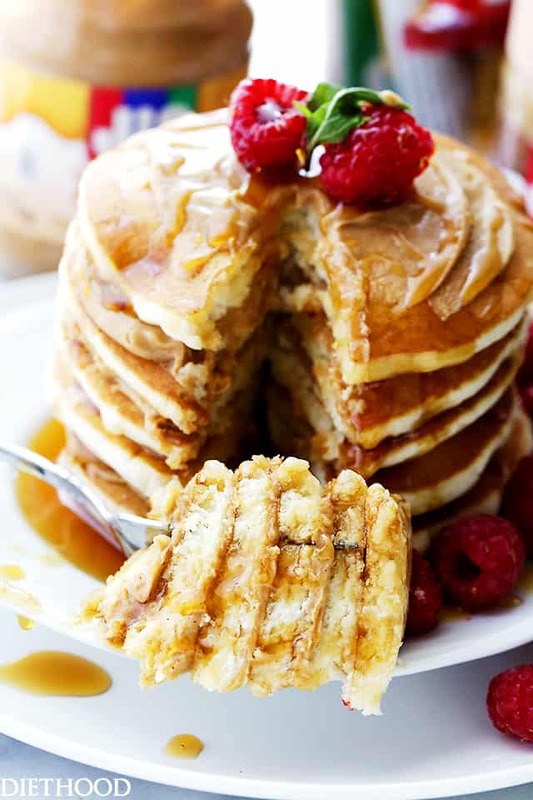 I think pancakes are the most absolute perfect recipe for a Monday ’cause on this day we still wish it was Sunday, and nothing feels more like a Sunday than a tall stack of soft, fluffy, pillowy pancakes. Talk about a forever long sentence, eh? Just trying to get all my thoughts in there, that’s all. Gah. Do you know that people really like a boxed mix to make buttermilk pancakes? That’s ludicrous! And, while many resort to pancake mix when making a special weekend breakfast, honestly homemade pancakes are a must. The batter takes just as long to make as a boxed mix – really, it does! – and the result is INFINITELY BETTER. You know what I’ve learned? I’ll tell you. Making the best ever pancakes is an exercise lesson in patience. There may have been struggles with burned bottoms and doughy interiors in my experiences, but iz all good… all good things take time to learn and time to perfect. Heat griddle or pan over medium heat until a drop of water skitters across the surface. Lightly grease the pan with oil or clarified butter. <<< mucho importante! Regular butter will burn. Use a measuring cup to evenly portion out the batter. Turn over the pancake when it’s dry around the edges and bubbles have formed over the top and popped. If your pancake is burned on the outside and raw on the inside, turn down the heat. I always throw out the first 2, maybe even 3 pancakes, while trying to find the perfect cooking temperature. <<< my truth. Now that you have all the ins and outs that I’VE learned, please leave a comment and let me know your best tips for the perfect pancakes! Get your face right in there. You’re like, wait, that’s too close? PUH-LEASE! 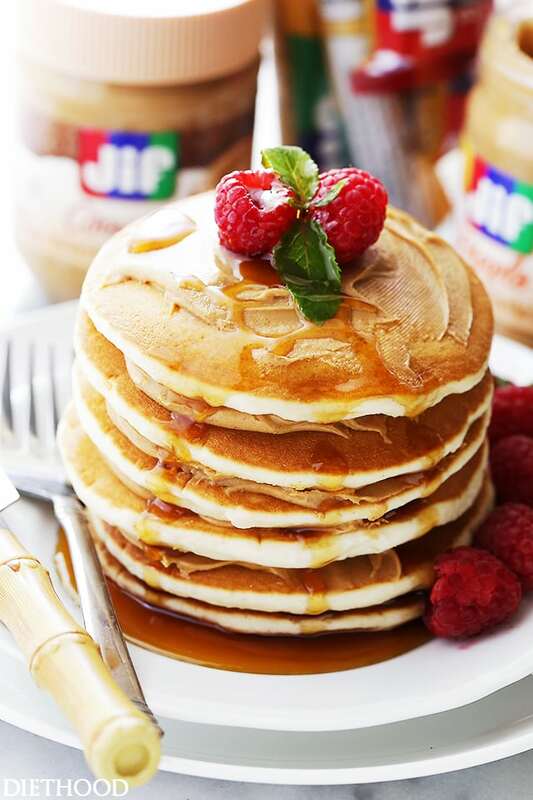 You and I both know that a person can never be too close to pancakes. Buttermilk Pancakes - Fluffy, buttery and delicious, these are the most perfect Buttermilk Pancakes. Ditch the store-bought mix and make your own pancakes from scratch! In your mixer's bowl beat eggs on medium speed until frothy. Add buttermilk, melted butter and vanilla; continue to beat until just blended. Set aside. In a separate bowl, combine flour, sugar, baking powder, baking soda, cinnamon, and salt; whisk until thoroughly incorporated. Add the flour mixture to the buttermilk mixture and, using a wooden spoon or a rubber spatula, mix just enough to combine; batter should be creamy, but lumpy. DO NOT OVERMIX. Heat a heavy-bottomed skillet or griddle over high heat. Lightly grease the skillet with oil or nonstick cooking spray. Lower heat to medium-high and pour about 1/4 cup batter into skillet for each pancake - make sure there is enough space between the pancakes because they will expand during cooking. Cook pancakes for about 2 minutes, or until batter is set and bubbles cover the top while the bottom is golden brown. If the pancakes are cooking too fast on the outside, but still doughy on the inside, lower the heat to a medium. Flip pancakes and continue to cook for 1 minute, or until golden brown on the bottom. Repeat with remaining batter, adding more oil to pan as necessary. Serve with spreads, jams, butter, maple syrup, strawberry syrup, fruit compotes, etc. Hi! Pancakes look great. I am trying to convert to WW points, so I notice you don’t have points listed or the the number of servings. How many pancakes does this recipe make? Those pancakes look perfect! Thomas would love these!! Pass me the pancakes! These are perfection! The perfect classic breakfast. I haven’t had a chance to make any pancakes for a while and this is really calling my name. I try to make them soon! I can’t get over how perfect these pancakes are! They look wonderful! Taking the extra ingredients to make buttermilk pancakes is totally worth it! Those look so pillowy, I’m ready for that entire stack! YUM! 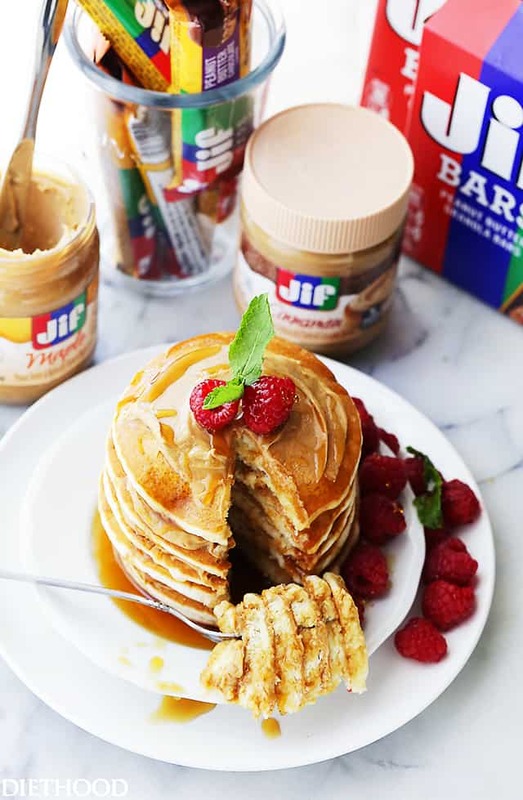 I’m a sucker for homemade pancakes, and I can see us making these this weekend as a special treat. And adding peanut butter? One of my favorite options for pancakes! I’d never tried those as a kid until I went on a choir tour, and our host family introduced us to it. It’s soooooooo good! GYROS COST TOO MUCH TO GET AT MY GREEK SHOP AND I THING I CAN MAKE A GOOD SUBSTITUTE. Hi Janet!! I don’t have a recipe for gyros, buuuuut! How about my Grilled Mediterranean Turkey Meatballs? They are SOOO good! And you can play around with the ingredients.